Sometimes I start projects without a lot of planning. Sometimes I rely on guesstimations (let’s pretend that’s not a totally obnoxious word for a moment). Sometimes I just order a bunch of fabric to make sure I’ll have enough without realizing how much extra I’ll have or planning what to do with the excess. 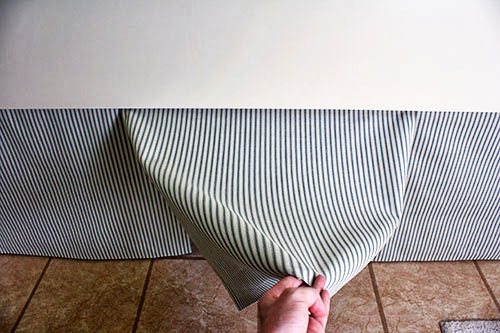 Such is the case with that green ticking stripe fabric I used to make the bathroom panels. While I did need more than one yard for that project, I still had quite a bit leftover from the two yards I ordered. 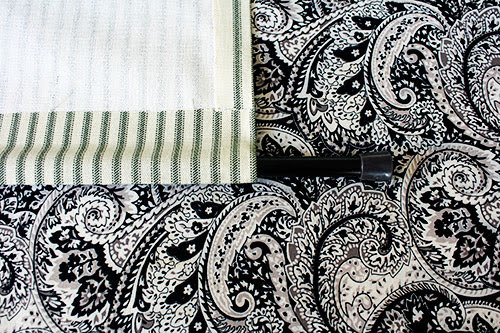 So I decided to put it to use, go a little matchy-matchy, and make a window treatment for the bathroom window. 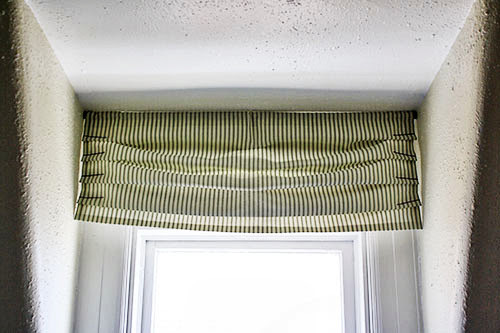 Because we don’t need to worry about privacy with this window (the window is high, we’re on the third floor, and the window faces a wall on the adjacent house), I decided to make a no-sew faux roman shade. A fauxman shade, if you will. And I will. 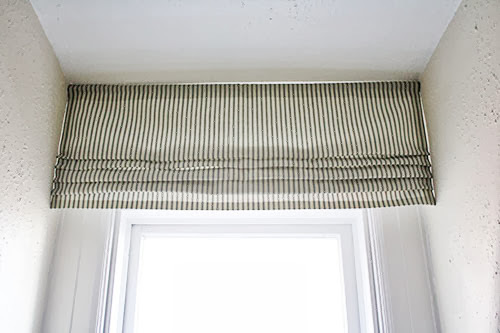 There are plenty of tutorials out there for faux shades – I’m partial to this one by Centsational Girl, although this method is pretty genius too – but I ended up skipping all of them in favor of keeping it as simple and cheap as possible. And what’s super simple? 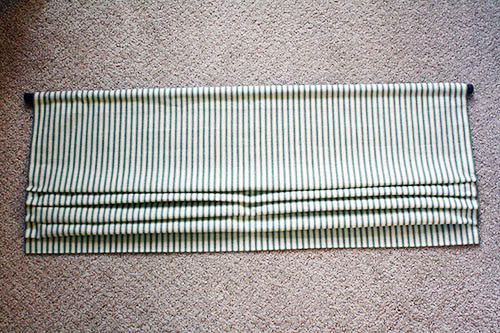 One rectangle, two feet long and as wide as the window, with edges finished in hem tape. 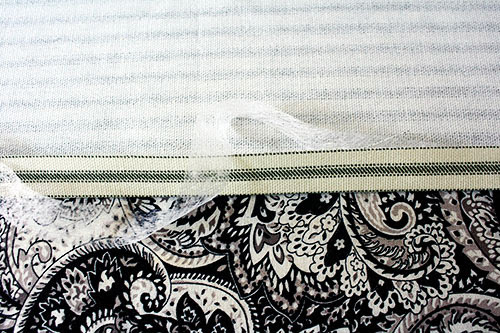 On one end, I made a rod pocket with hem tape (just folded over, with a gap to accommodate the rod). It snugly fits this tension rod, which I found at Target for all of six bucks. I picked ORB finish, simply because that’s the only finish they had in stock. It doesn’t matter, because you can’t see the rod in the finished product anyway. 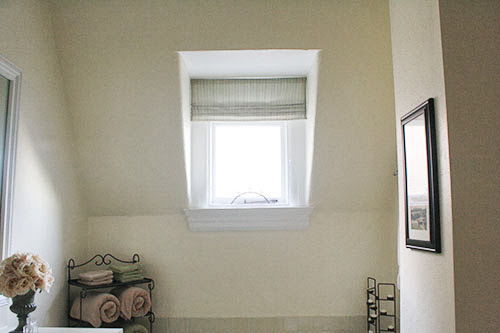 At this point, I had a basic hanging panel that I could use to dress the bathroom window. 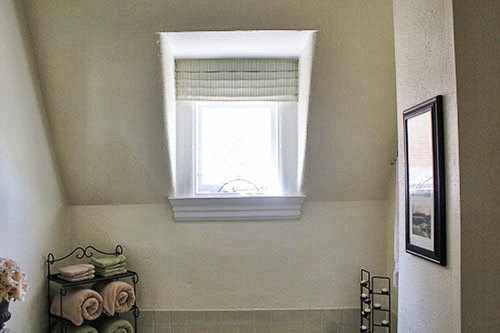 But of course, I didn’t want a plain long panel, I wanted a fauxman shade – partly because I like the look, but also because I couldn’t bear to block any light from the tiny bathroom window. So, I balanced on the edge of the bathtub in order to hang the shade and figure out exactly how long I wanted it to hang. Then, to figure out exactly where to make pleats, I mocked it up with my favorite curtain-making tool (seen here and here): bobby pins. Yes, it looks goofy. But it works! 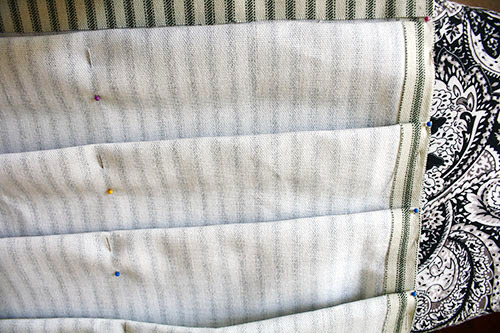 Once I had evenly-spaced pleats, I took it back down and used straight pins to pin the pleats in place. No sewing. No heat-and-bonding, even! I reasoned that nobody would be looking at the curtain closely enough to ever the pins showing on the sides, and I really couldn’t be bothered to get out the sewing kit and make it permanent. ... I realized that actual roman shades don’t fold up that way. Sure, Kate did evenly-spaced pleats on her fauxman shade, but they suddenly seemed very unnatural. Also, Mr. P mentioned that the pleats looked kind of dumb. Harsh critic, but he’s got a point. Therrrrre we go! I was finally happy with it! Especially in its place in the window. It’s a small change, but anything that I can do to make this rental feel more personalized is an improvement in my book – even if the pleats are as temporary as our living arrangement. Although, I told you that nobody would notice the straight pins. See them? Nope. That’s what I thought! 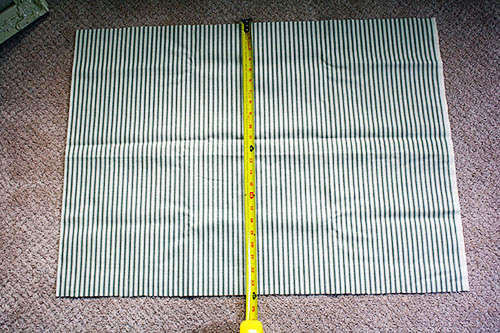 Measuring and ironing the hems on the fabric took all of twenty minutes. Adjusting and re-pinning the pleats took some time to figure out exactly how I wanted it, but all told, it took less than an hour. I love the Roman shade. It's amazing how something so small can make such a difference. 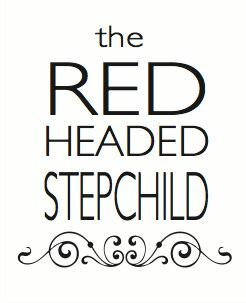 And I love Mr. P's harsh, yet so husband-like critic.